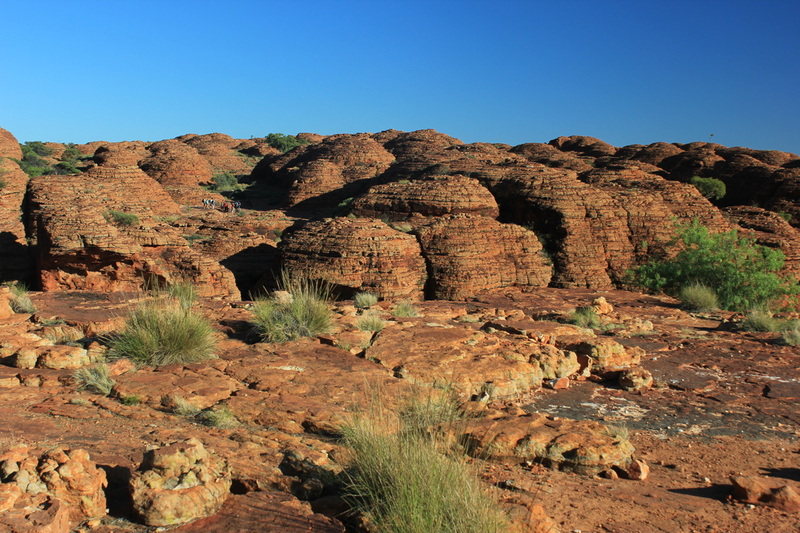 Kings Canyon is part of the Watarrka National Park in the Northern Territory. To get there, you have a few different options, but travelling by road will take between 4-5 hours from Alice Springs. There are a couple of ways to come in via road, and one way is via the Larapinta Loop Road (198km unsealed road) which is the way we came (you think the road will never end) or via Stuart Highway (sealed) or Ernest Giles Road (sealed for most part, 70km unsealed). Accommodation options are limited - you can go to Kings Canyon Resort or Kings Creek Station. We chose the former because it was the closest option to Kings Canyon, and we wanted to minimise our driving time where possible. It is only 9km from Kings Canyon. 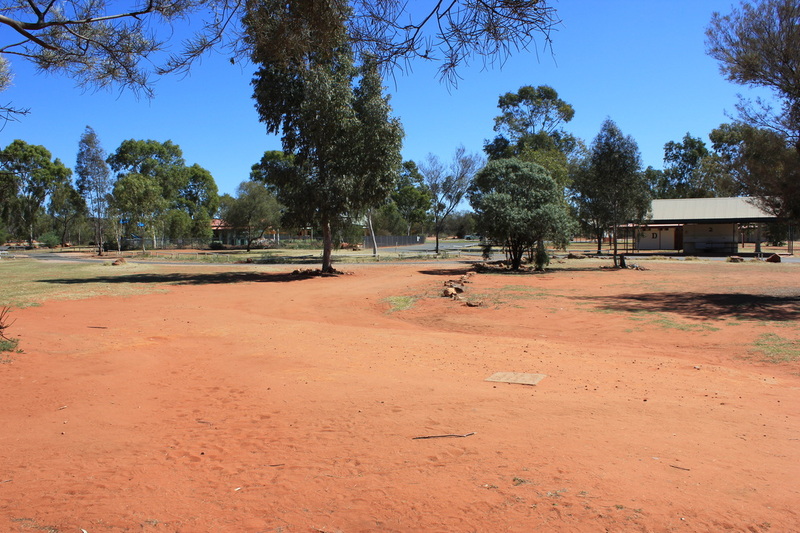 We did investigate Kings Creek Station which we had heard good things about too but after looking at it, we didn't find it appealing enough to want to set up camp there - it will come down to personal preferences I am sure. As mentioned, we camped at Kings Canyon Resort. Pricing is available at their site. 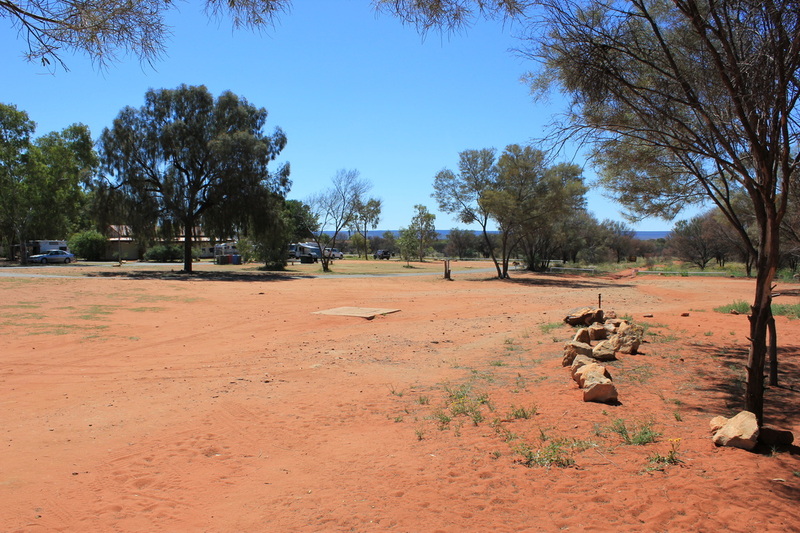 Like Yulara camping at Uluru, there are a number of accommodation options available to you, including hotel, backpacker lodges and camping. You have powered and unpowered sites, and for the tent campers, there are no designated sites, just choose a spot and set up. Shade was very limited, and in high demand despite the campground not being busy! There are not a lot of trees around in the tent area, and we were lucky enough to secure a small spot which did provide shade for our tents and definitely was the pick of the area! In fact, within 10 mins of us packing up from the site, other campers claimed it! In warmer weather, I strongly suggest you bring some shade shelter for yourself. We also travelled at end of peak season, so that gave us more opportunities to find a good location for the tents. Ground is very hard and dusty. A tent not properly zipped up, will result in the contents being covered in a fine red dust! Pictures below, give you an idea of the area where you can set up camp - caravan section is not pictured. The caravan/trailer section had more shade than anywhere else. Note that there are some limited grassed areas, but predominantly red dust! The campground had more amenities blocks than any other campground we had seen. They are ample. Large and clean (though looking dated and needing a revamp), they are scattered throughout the campsites, and have showers/toilets. In peak time, having this many amenities blocks would be wonderful. All toilet entrances have a gate to enter (and prevent dingoes from entering the block). It was here at Kings Canyon, where we saw our first dingo of the trip! Each block has its own laundry, situated outside the block comprising of 3 washing machines, and 4 laundry tubs (finding a plug was a challenge) plus a clothes line. There are 2 camp kitchens. They are not signposted (in fact, that is a suggestion to Kings Canyon Resort - better signage around the camp). You will find them in the backpacker lodge area - just an inconspicuous brown door - which leads to a small kitchen containing a stove, fridge, microwave and a few chairs plus kitchen sink. No kettle, toaster or utensils (due to theft, they are no longer available). There are some shelters with table/chair and wash up sink around the sites as well. A great pool is located in the campground, and much appreciated on a hot day by all (it was icy!!) There is a BBQ in the pool area, plus seating and some undercover areas, plus an outdoor shower. Also at the resort (and close to campground) is a petrol station which sells a small amount of groceries and souvenirs. A restaurant is next door plus bar. When we visited, no campfires allowed (not that we needed them as it was so warm). There is a lot of lighting at night around the campground - in fact, a little too much. Whilst I appreciate need around the toilet blocks, the backpacker lodge, had all external lights on all night, plus some other larger lights around camping area. Makes it very bright! Note: Dingoes are around, so ensure your food is properly stored. They are clever too, and can easily get into bins and pull rubbish bags (in their entirety) out of the bin, and then make one big mess!! The main reason is to see Kings Canyon! Once you have seen that (and a must is to do the Rim Walk), then there is not much else to see and do. The Rim Walk is magnificent, and whilst the climb to the top at the very beginning is tough, as long as you have reasonable level of fitness, plenty of water, and take your time, it can be done, and wasn't as bad as we had heard! To truly appreciate this Canyon, you need to do this walk. If the weather is warm, get to the Canyon by 7am! That way you can not only enjoy the coolness of the day, but see the Canyon in beautiful light. Don't attempt it in the middle of the day. We heard of rescues of climbers who have tried it in the heat or who weren't prepared. Once up at the top, there is minimal other climbing - sometimes clambering over and up rocks, but nothing tricky. Allow 3 hours to do the walk, which includes plenty of time for taking photos or just taking in the scenery. Around every corner of this walk, you see another beautiful sight - sights you just wouldn't see from gazing up at it or flying over it. We could see why this is often the NT location that really makes jaws drop! If you want to see the Canyon at sunset, there is a viewing platform right next to the camping area. It has tables and chairs, so if you get there early, you can have a seat! Its a nice spot to relax and see the colours of the Canyon, though it doesn't really show it off in its full glory! (Nor does any photo). 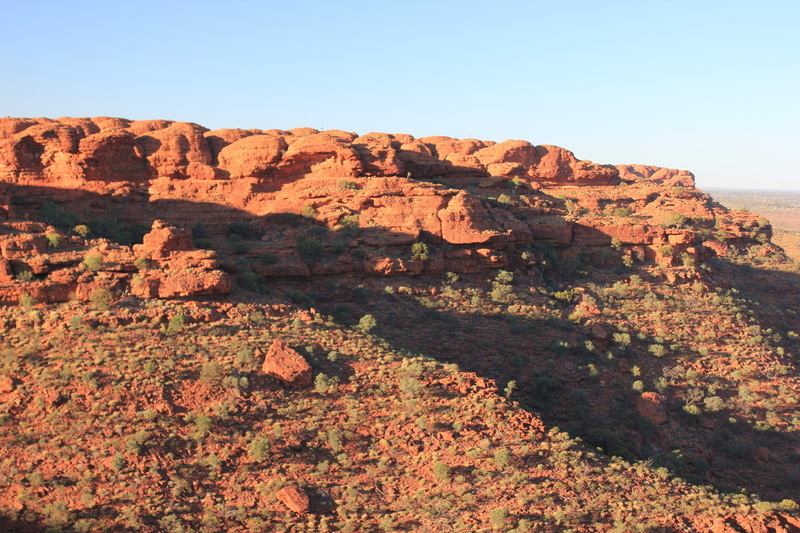 Kings Canyon is a must for any trip to the NT. We loved it as much, if not more, than Uluru. If you really want to see the Canyon properly, the only way is the Rim Walk. I don't think any other walk could compare. Would we recommend Kings Canyon Resort: For staying 1-2 nights, I think this campground was perfect for our needs. Travelling at not a busy time, also was a bonus for us, as the camp was very quiet. I can't imagine staying longer, unless I planned to do the walk each day!